Keeping your weight down might depend in part on how early you greet the sun, according to a new study that finds a link between bright morning light and a leaner physique. 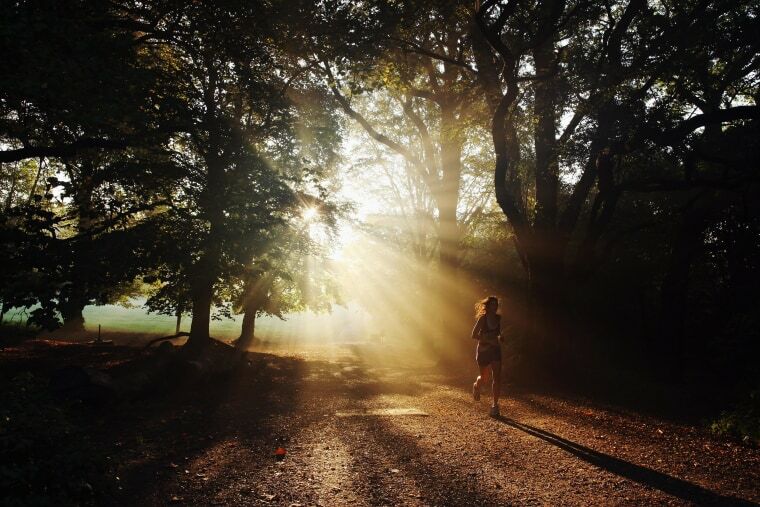 People who were exposed to even moderately bright natural light early in the day — typically between 8 a.m. and noon — had a lower body mass index, or BMI, than folks who got most of their light exposure in the late afternoon. That’s according to researchers at Northwestern University’s Feinberg School of Medicine, who discovered a new way to measure the combined impact of light timing, duration and intensity on BMI, a ratio of height to weight. “For every hour later in which an individual got the majority of their light exposure, that translated into 1.22 BMI units,” — or 5 pounds to 10 pounds on a 5-foot-8 person, says Dr. Phyllis Zee, a professor of neurology and director of the Northwestern Medicine Sleep and Circadian Rhythms Research Program. The study is published in the latest issue of the journal PLOS ONE. That could add up to an extra 30 pounds on a person who usually gets outside in the late afternoon instead of the morning, said Zee. It may be because bright morning light synchronizes circadian rhythms that also regulate energy balance, including hormones such as melatonin, which regulate sleep and weight cycles and affect obesity. Zee and colleagues studied 54 people with an average age of 30. The participants wore special wrist devices that monitored light exposure and sleep timing and duration for a week under normal conditions. They also reported their heights and weights and kept logs of food intake and exercise. “The message is that you should get more bright light between 8 a.m. and noon." Though it was a small study for a short time, Zee said she was encouraged to detect a strong signal that showed that getting early-day light was associated with lower BMI — even when the effects of diet and exercise were accounted for. Other researchers who study circadian rhythms say the new research is an important first step in better understanding the impact of light on weight. "That they found the link with BMI independent of caloric intake is pretty telling," said Laura Fonken, a neuroscientist at the University of Colorado Boulder who typically studies circadian rhythms in rodents. "Especially to show it in a human population," she added. The threshold for the link between light exposure and lower BMI was 500 lux, a measure of the amount and power of light. A room lit by a reading lamp and a TV might be 50 lux, an overcast day might be 1,000 lux, direct sunlight might be between 32,000 and 100,000 lux, experts say. “The message is that you should get more bright light between 8 a.m. and noon,” Zee said. That exposure could come from many sources, including morning light through the windows of a car or a lunchtime walk outside, Zee said. At the same time, it’s important to avoid brighter light later in the day or at night, which has been linked to increased obesity.